Christie Needham plays the organ in the chapel of the first ward building during an open house Friday, Aug. 10. Members of the First and Second Wards of The Church of Jesus Christ of Latter-day Saints celebrated the 100th anniversary of the dedication of their building recently in Logan. The First Ward building has a balcony which is unique to church buildings today. The historic brick building with large white pillars in front sits on the corner of 200 West and 100 South. 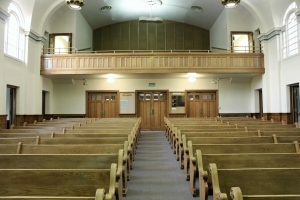 The floor in the chapel slopes toward the front, giving everyone in attendance an unobstructed view of the podium and choir seats. And the old pipe organ has survived several building remodels. Gene Needham, a counselor in the Logan West Stake Presidency and former bishop of the Logan First Ward, said the building is a special building. The building has Danish architecture, original wood molding in the chapel, and a balcony, all of which are uncommon in church buildings today. 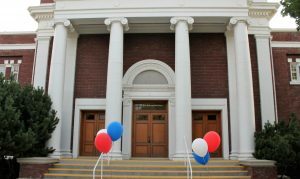 The historic brick building with large white pillars was designed with Danish architecture and sits on the corner of 200 West and 100 South.riday, August 10 marked 100 years since the dedication and was celebrated by an open house. It has a pipe organ that runs with air flow. Outside of the tabernacle there aren’t many around. “Most of them have been replaced,” he said. The building has been used by groups for concerts and firesides. Although the ward was organized in 1861, they didn’t have a home to meet in until the church was built. The ward met in the basement of the tabernacle, a room in the old Brigham Young Academy near Logan High School, and a bowery near the existing tabernacle.